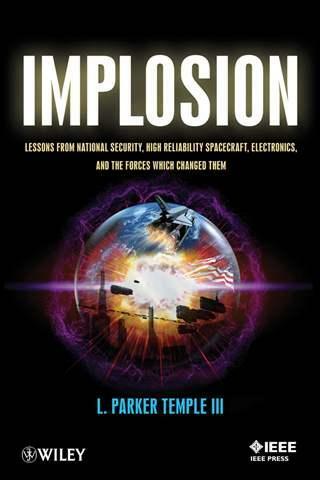 Implosion: Lessons from National Security, High Reliability Spacecraft, Electronics, and the Forces Which Changed Them. By L. Parker Temple. Hoboken, NJ: John Wiley & Sons for the IEEE Press, 2013. Paperback. Figures, tables, acknowledgments, acronyms, abbreviations, program names, index. ISBN: 978-1-118-46242-3. $54.95 USD. Solid-state electronics transformed human existence in the latter third of the twentieth century. Taking it for granted, most Americans use technologies based on this type of electronics every day. One cannot use a computer, telephone, television, or a host of other everyday devices without employing solid-state electronics. In this fully-documented study L. Parker Temple, a longtime space policy analyst and technologist, offers a useful history of this technology but even more hones in on the national security origins and evolution of this field before presenting a set of lessons learned and prescriptions for movement forward with this aspect of high technology. Temple begins in Implosion by exploring in quite useful detail the evolutionary nature of this complex technological transformation. It originated as a requirement for U.S. national security space efforts. The proliferation of applications for solid state electronics in the early Cold War era revolutionized the manner in which war would be waged ever after. Moreover, this technology had myriad applications beyond military equipment and changed the nature of consumer electronics as well. This is much more than a narrow study in the history of technology. The author focuses on the broad interrelationships of technology, innovation, systems, and policy to develop a useful analysis of technological leap-frogging more than a generation into the future. In the process he offers lessons that will be of merit to engineers, project managers, military officers, and other technology professionals in addition to historians. I was especially entranced by Temple’s complex analysis of the evolution of military standards and practices for technology ranging from individual parts to whole systems. Temple also draws out the immensely significant but largely unfathomable system of acquisition within the federal government, as well as the major policy that changed these practices over time. All of this suggests that L. Parker Temple’s work, Implosion, is more than a history, more than a policy analysis, more than an engineering study, and more than a management tome. It has elements of all four, but its real value is in the amalgamation of these divergent elements into a meaningful whole. This entry was posted in History, Politics, Space and tagged history of technology, IEEE Press, John Wiley & Sons, L. Parker Temple, solid-state electronics. Bookmark the permalink.